If you are looking at a slightly longer weekend road trip from Chennai, Chennai to Tranquebar, will give you enough to keep you in good spirits and quench your thirst for an outing with nature and history. Move away from the heat of Chennai to the French part of India, Pondicherry now Puducherry, glide through the mangrove forests of the world's second largest mangrove jungle and finally visit the remnants of Danish history in India in Tranquebar, a former colony of Denmark. Here is a guide to a long weekend road trip from Chennai that will remain etched in your memory for a long time to come. From Chennai first head to Pondicherry either along the East Coast Road or the National Highway. Both the routes will roughly take the same amount of time - 3 hours. Spend the day in Pondicherry. Check out what to do in Pondicherry here. Early next morning head out from Pondicherry to Pichavaram which is less than an hour's drive from here. The sun can be merciless during the middle of the day and the humidity will add to your pain so be sure to reach Pichavaram by around 9 in the morning. Country boats and motor boats are available to see the mangrove forest and the beach but we suggest going with a country boat as mechanized boats can't go in some of the narrower and smaller canals of the jungle. Be aware that you will need to shelve out a 'tip' (200-400 rupees) to the country boatmen for them to take you inside these narrower and smaller canals. Go for it. It is well worth the money. The boat trip will take between 2 -3 hours so you should be done by 12 or 1. Go to Trivandrum for lunch which is another half an hour's drive away. From there, one hour later you will be in Tranquebar. 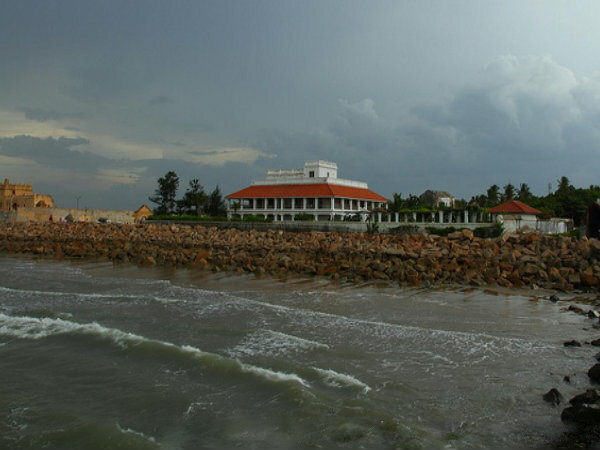 Tranquebar also known as Tharangambadi, is a former 17th century Danish colony. The name means 'place of the singing waves'. The Danes had this colony under them for almost 225 years until they ceded it to the British in 1845. It was once a busy fort but later lost its importance after a railway was opened. Do not expect much in terms of tourist amenities in Tranquebar. Four places are available to stay one simply called ' Bungalow on the Beach', 'Tamil Nadu House' , 'The Gate House' and ' The nayak House'. 'Bungalow on the Beach' has a restaurant which serves good food. After taking a nap maybe, you are free to look around the place in the afternoon. Fort Dansborg was constructed from 1620 soon after the arrival of the first Danish trading expedition and it was reconstructed over the years. In the olden days, the fort was surrounded by a moat which has completely disappeared now. Check out the small Danish museum in the premises of the fort. Entry fee is Rs 5 and it is open from 10.30 am to 5 pm. 'Landporten' as the town gate is called in Danish forms part of the fortifications that were built around Tranquebar in the 1660s. The original gate was destroyed in 1791 and the present one constructed in its place. The New Jerusalem Church was built in 1718 when the existing church proved too small. Batholomaus Ziegenbalg, the first protestant missionary to South East Asia constructed the church. The Zion Church was consecrated in 1701 and is the oldest protestant church in India. A museum put together by the Dutch and not the Indian government after the 2004 Tsunami, there is no entry fee and the guide inside is very informative. You can buy books, postcards and maps here which tell the history and also show the original size of Tranquebar, most of which has been claimed by the sea now. This temple has 3 gopurams out of which 2 are already submerged by the sea. It dates back to the Pandyan era and according to an inscription in the Dansborg museum this temple was erected in 1306. A restoration scheme for the temple is in the works.